An Old Boy of the famous Adisadel College in Cape Coast, Prince Kwasi Mensah lives by the motto, ‘Either the best or with the best’ (which is a variation of his Alma Mater’s motto, ‘Either the first or with the first’). Born in Ghana, West Africa, Prince Mensah has been writing poetry, plays and short stories since the age of seven. He has twenty-five stage plays to his credit. Some of them have been acted at the Accra Arts Center and at several locations in Accra. His articles and stories have been published in the STEP magazine, P & P and the Free Press. Prince has published eight books of poetry. They are Memoirs of A Native Son, I Shall, I Will, I Can (Poetry Inspired by Barack Obama), Afrocentric, ecclesiastes, State of An Abstract Mind, The Griot Metropolitan, The Land of Broken Mirrors and Coronation. Subsequent publications such as Enough is Enough and World War-Free are being expected later this year. His poetry was featured on UNESCO’s Other Voices Poetry Project last year. 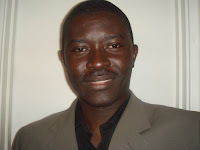 His essay, ‘An African’s Epistle to the Mosquito’ will be featured in Dike Okoro’s Anthology of Emerging Writers in Africa 2009. 1. This poem is quite different from others you've had published at OGOV, it is much more sparse and concise, and more introspective. Does this represent a general change in your writing? If so, what brought you to this change? I attempt to use the poetic techniques that are at my disposal. This poem came to being after such an experiment. I must confess to a state of melancholy during the time I wrote this poem. I was going through a phase of disillusionment, which brought out these feelings in the poem. I realized that in life, no matter where we are, each person is at the very beginning of the beginning. No one has scratched the surface of their own potential. We always think we have but the variables points to a thousand possibilities, which is saddening because you tend to think it is all a waste of time. However, such introspection is good for the soul of any writer. It is the ability to understand the unseen suffering and the unuttered sorrow that makes the difference between a poet and a non-poet. My writing has evolved as frequent exposure to new concepts occurs. I realize that I can be African as my source motivation and still express myself through foreign poetic devices. This does not diminish my delivery in any way. It rather enhances it and assists me to connect to a wider demographic of readers. Even though I cannot detach myself from my identity, I can retain everything essential to my on-going education as a student of life. This enables me to reach the maturity needed in the process of writing, the ability to master the various thoughts and concepts I espouse in my own writings. A poet must understand what he/she is talking about. 2. This poem seems to be channeling the haiku form. Was this intentionally done, or did it arise naturally? It arose naturally. Honestly, I did not have haiku in mind but I think, subliminally, the poem demanded a haiku-like mood to convey its meaning. I used gist to capture grief. 3. How do you think African writers can best utilize non-African poetic forms (haikus, sonnets, etc.) without at the same time losing a sense of "Africanness" in their writing (if, of course, this is their goal)? Oh yes! I am a big believer in learning something new. I think it was Winston Churchill who said, ‘Personally I'm always ready to learn, although I do not always like being taught.’ There is always something new for all of us to learn. The way people think and speak is always fascinating to me. The way other cultures tell their myths and legends. The way each individual talks about life through their unique perspectives. There is nothing wrong in using non-African poetic forms. I am into sonnets, sestets, limericks and tongue-twisters. 4. You've been an active participant in recent, sometimes heated, discussions on this site about polygamy, the chieftancy system, and more. How have you found these discussions? How do you think we can encourage more, and richer, conversations in the future? I appreciate the fact that we have been very civil on this site. No swear words, no acrimony. We show the world that we can agree to disagree and be agreeable about it. The discussions have exposed the deep-seeded conviction each poet carries and the length each would take to make themselves clear. This is very good because our nations need that. I think the poems that prompted such discussions are superb and I want to use this medium to congratulate the poets. Obviously, I have my opinions about things and do use my writings to put them across. I also believe that having discussions, like the ones we have had in the past, will sharpen our persuasion skills, which is important in today’s world of divergent opinions. One thing is for certain, each poet who has been featured on this site has the potential for greatness and we must use the feedback we receive to enhance our writing prowess. In the end, this will be a testament to our collective decision to elevate the importance of literature in our motherland. 5. This poem is from your new collection "Enough is Enough". Could you tell us more about the status of that project? "Enough is Enough" shall be in print in June 2009. This book of poetry is about being fed up with one’s status in life. The intention is to galvanize people to awake from the stupor of settling for less or allowing things to remain as they are. I have realized that the more I write these poems, the more I realize that there is so much in life to be written about. One Ghana, One Voice magazine has been, and shall always be, the incubator of talent. We must do our best, individually and collectively, to assist in the drive to make this magazine the most noticed website when it comes to African poetry. Tell a friend about this site. Call radio stations. Inform newspapers. We are in the forefront of something big, so let us work hard to make things happen. I am ready to work with any college or university in the USA that wants to organize a program about African poetry. Was at Adisco myself... do you mean Enough is Enough will come out in June 2009? or 2008? Sorry, Nana. I meant 2009. Thanks for looking out.